A few months ago I found this frame at a thrift store. I put it on my facebook page that I have big plans for it (I did). I ordered the pieces I needed to do what I wanted and then life happened… isn’t that always the way? So it sat in my workshop. Finally yesterday I just pulled it out and went to work. I gave it a quick paint job and used cabinet concealer and wiped it back with damp cheesecloth. I filled the frame with a thin piece of wood I had in the garage. 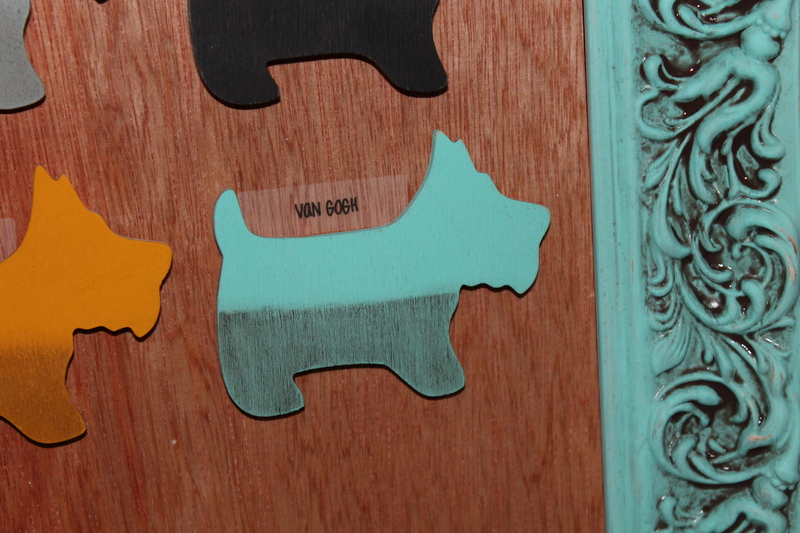 A while ago I had some really cool wooden cutouts of Scottie dogs made for me. I painted 25 of them in the fabulous colors of van Gogh and waxed them. Natural on top, and French Caffeine on the bottom. Then I wondered the best way to mount them. In July at Haven conference, 3M was there with all kinds of amazing products. 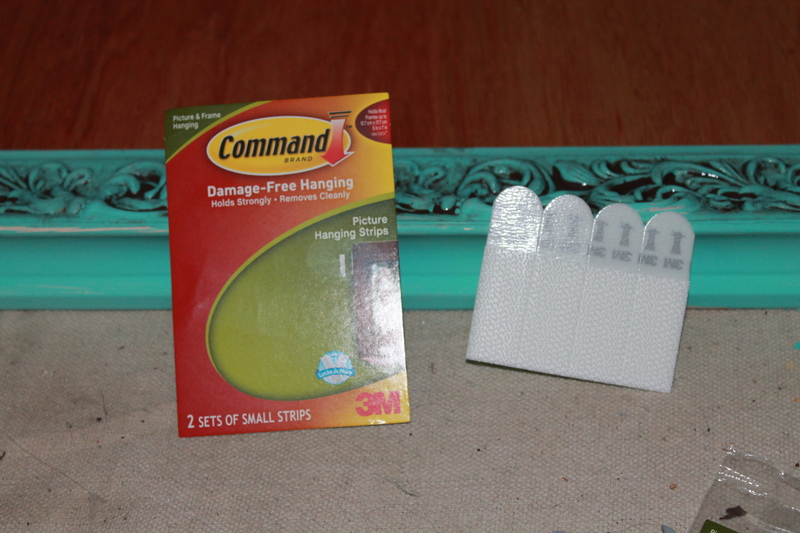 One of them was command strips to hang pictures- they had TONS. I had gone by the booth just as they were trying to pack up and the great girl there gave me “eleventy kajillion” of them (to quote Mandie of Altard). While trying to figure it all out, I remembered them sitting there in my fabulous bag from the conference, so I pulled them out. There are 4 strips in each package. 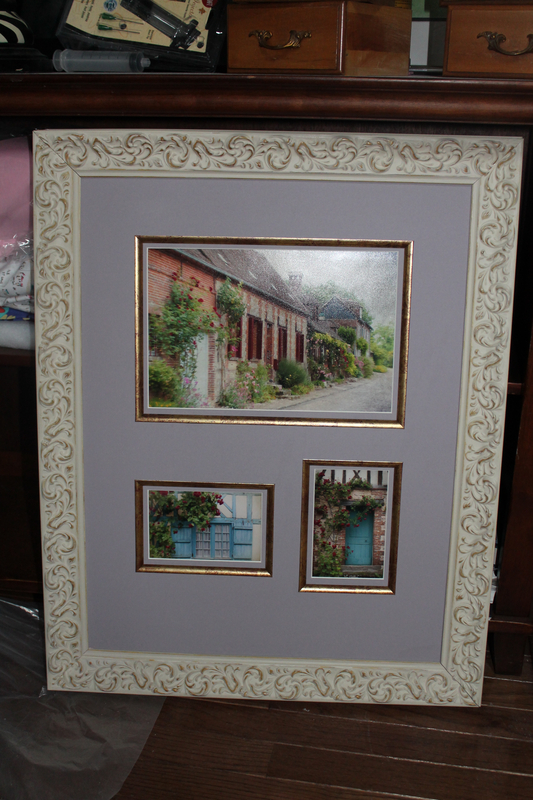 A 5×7 or light 8×10 frame should hang easily with these- I believe you can hang a larger frame just using more of them. 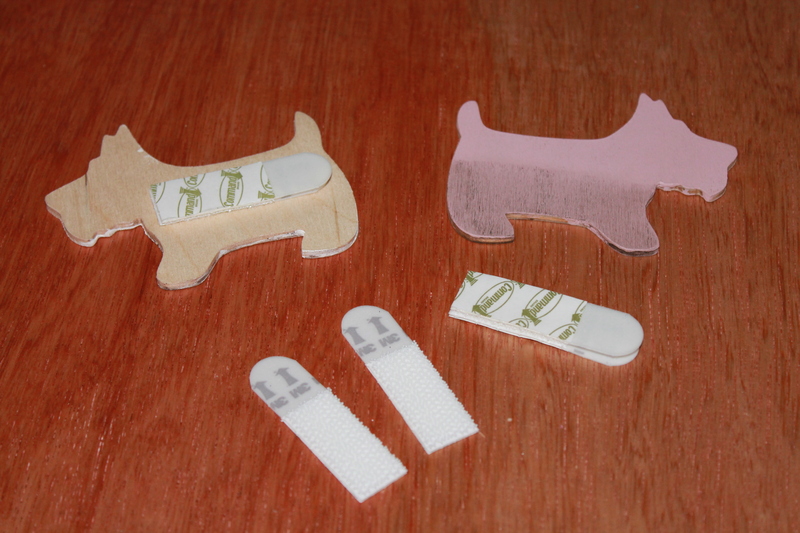 After separating the 4 pieces, I connected two of them together and then pulled the paper off one side and stuck it to the back of the puppy. 3M Command strips separated, together, and attached to the samples. 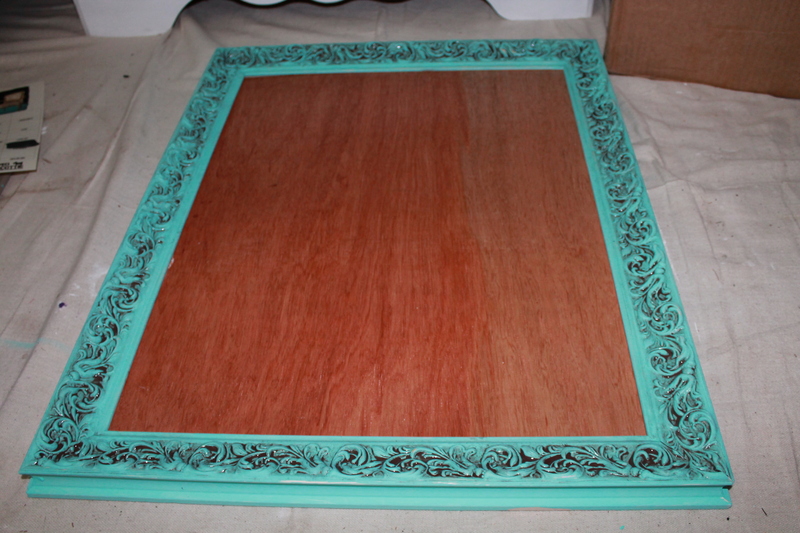 Then I laid all the colors out on the panel inside the frame to figure out spacing. Once I decided that, I pulled off the other side of the backing and pressed them down. The great part is a few times I put them on crooked. Instead of having to make a mess pulling the sticky mess off, I was easily able to gently take them off and reattach the piece with the hook and loop fasteners. One day if I need to do something completely different, I can pull the entire fastener off without damage to the panel. I love that! 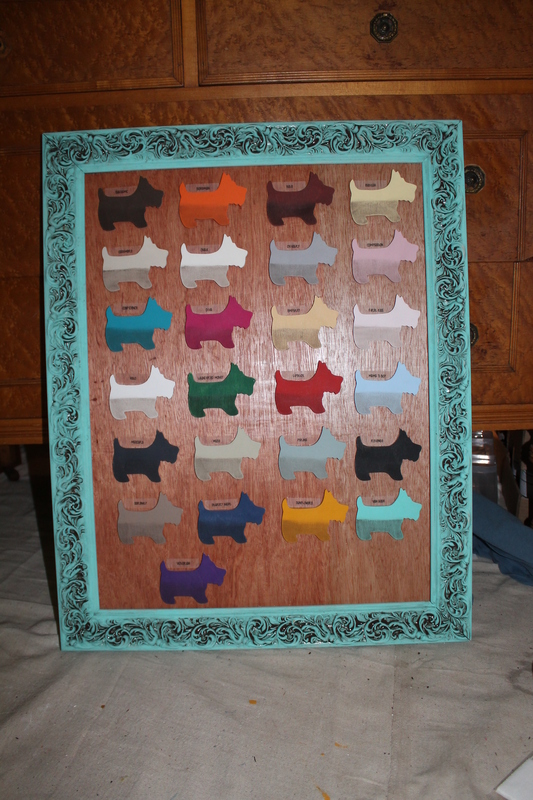 When I was done placing all the puppies on the panel (say that three times fast), I needed to display the color names. 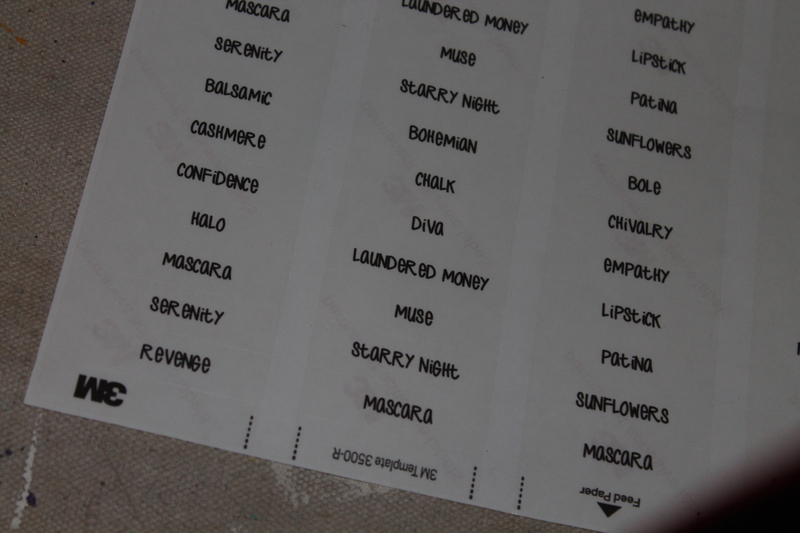 The grain on the panel is so pretty that I wanted the label to be as low profile as possible so I used return address labels that were clear. I looked at the bottom of the page and guess what? 3M! I used them right at the curve in the back of each pup and VOILA! My daughter used a Command hook in her bathroom, but I have never used them personally. I was impressed with how easy they are to use and how easy it was to move the pups when they were crooked or may or may not have been in the wrong order. What do you think: Have you tried any of 3M’s Command products, Do you like my set up to display all the van Gogh colors? yah, I do. I love it. So cute!